Fruit preserves are preparations of fruits, vegetables and sugar, often canned or sealed for long-term storage. 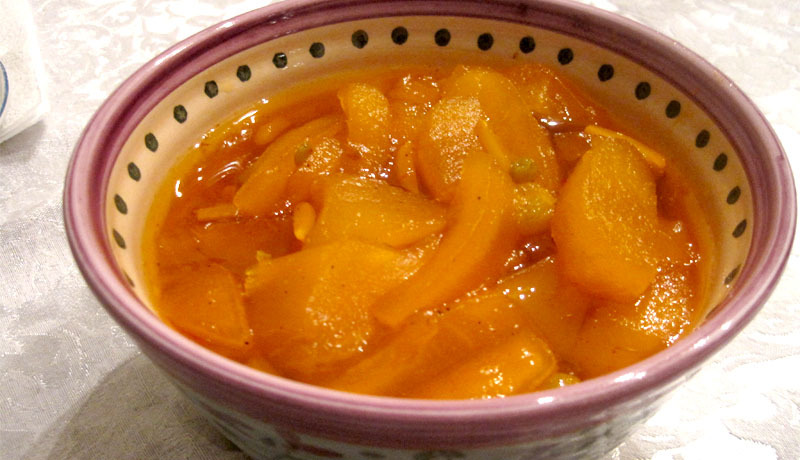 The preparation of fruit preserves today often involves adding commercial or natural pectin as a gelling agent, although sugar or honey may be used as well. Before World War II, fruit preserve recipes did not include pectin, and many artisan jams today are made without pectin. The ingredients used and how they are prepared determine the type of preserves; jams, jellies, and marmalades are all examples of different styles of fruit preserves that vary based upon the fruit used. Many varieties of fruit preserves are made globally, including sweet fruit preserves, such as strawberry, as well as savoury preserves of vegetables, such as tomatoes or squash. In American English, the plural form "preserves" is used to describe all types of jams and jellies. In all other English speaking countries most fruit preserves are simply called jam, with the singular preserve being applied to high fruit content jam, often for marketing purposes. Additionally, the name of the type of fruit preserves will also vary depending on the regional variant of English being used. Recipe for Fruit preserves see Here.